This newly built flat, in a splendid ventilated and quiet location, has a magnificent view of the sea and the Tavolara Island. It features a small outdoor terrace with sea view, ideal if you want to have lunch/dinner admiring the panorama of the isle. It is 1 km away from the Porto San Paolo beach and the landing stage to the isle, 5 km away from the peninsula of Capocodacavallo and from the beautiful beach of Cala Brandinchi, famous for the BILBOA ads. 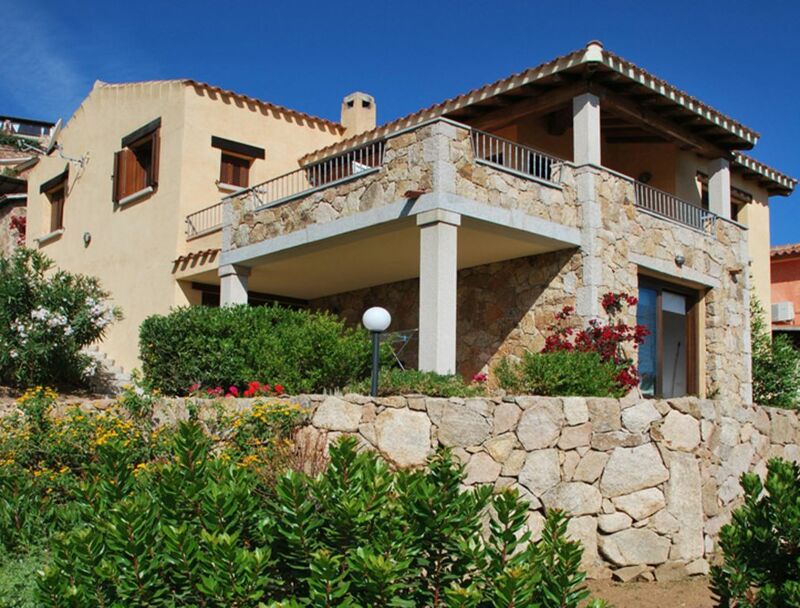 It is well connected to the Olbia airport and port (just 20 km away), it is an ideal starting point to arrange some daytrips to the Costa Smeralda (35 km), to the Maddalena Archipelago (70 km), or to the Gulf of Orosei to the south. Schön eingerichtete Wohnung, alles da was benötigt wird. Sehr sauber und ordentlich. Der Ausblick ist ein Traum, immer wieder gerne! Die Lage der Wohnung ist toll und die Wohnung mit dem Auto vom Ortskern in 5 Minuten zu erreichen. Aus der Essplatz auf der Terasse ist außergewöhnlich schön und sogar meist schattig. Leider sind die Fotos zur Wohnung nach wie vor nicht richtig zugeordnet, denn sie gehören teils offensichtlich zu nebenliegenden Appartments. Die Ausstattung der Wohnung ist ok, alles ist sehr sauber. Das Fernsehen zeigt keine deutschen Sender. Die Mutter des Vermieters war immer hilfsbereit. Die besten Strände sind mit dem Auto in 10 Minuten zu erreichen. Wir haben uns hier im Oktober sehr wohlgefühlt, vor allem weil die Infrastruktur gut ist und man noch gut schwimmen konnte. Für unternehmungslustige Urlauber mit Mietauto perfekt ! Questo appartamento intastonato nella collina difronte a Tavolara, la vista è spettacolare..! All’alba vedi sorgere il sole sulla montagna.. e la sera al tramonto si colora di rosso.. Proprietari fantastici! Dopo aver fatto presente che il frigorifero non funzionava ci ha fatto arrivare un frigorifero NUOVO apposta..! Vicina al centro di Porto San Paolo e ottima se si cerca un posto fuori dal caos di San Teodoro ma comunque raggiungibile in 10 min in auto..! Stra consigliato !! Proprietario gentile. Vista molto bella. Immobile pulito . Camera poco arieggiata. Appartamento ben attrezzato e con una vista magnifica! Abbiamo trovato l'appartamento veramente pulitissimo. La cucina è molto atrezzata, il bagno e la stanza confortevoli. Nel terrazzo c'è un bel tavolo dove mangiare la sera o fare colazione al mattino godendosi della vista mozzafiato sull'isola della Tavolara. La signora Vilma è stato un vero incanto. Di una tenerezza e ospitalità davvero magnifiche. A la prossima e grazie ancora di tutto! From the Airport or from Olbia, take the coastal road toward Nuoro, San Teodoro. At Porto San Paolo (about 14 km) go straight on to the end of the village and take the last street to the right, near the La Conchiglia Restaurant. Then drive up the hill for 800 m. Get in touch with us when you arrive at San Paolo. We will guide you to our property. Porto San Paolo is the easiest point to Tavolara Island, where you will find the famous Area Marina Protetta of Tavolara. In July, there is the Tavolara Festival, one of the most famous film festivals in Italy, where you can watch many films al fresco– with many celebrities and the Tavolara beach in the background. This is one of the most beautiful and famous areas in Sardinia, just 40 km away from the Costa Smeralda, with the Coda Cavallo peninsula and the famous beach of Cala Brandinchi. Just 10 km away you can find San Teodoro, a tourist destination famous for its nightlife. San Teodoro hosts some famous beaches like Cinta and Isuledda. It is possible to arrange daytrips with hill walking.